20s 20secs Voice Chips and Self Recordable Sound Modules Ideal for custom audio promotional products such as musical greeting cards, musical invitations, talking brochures, and media kits. We are Greeting Cards Sound Module manufacturer, Recordable Sound Module supplier & factory, offer Recordable Musical Module for customers. These can be used in greeting cards with sound, direct mail, mailers, corporate promotions, business promotions, wedding invitations, baby announcements, bar mitzvah invitations and more. Press and hold the record button, recording starts after a “beep” sound. You will hear “beep, beep” sound after the 10 seconds’ recording. And it will play what you have just recorded. Press the play button to play your records after all recording finished. Add music to your greeting cards with our Slider Sound Module. 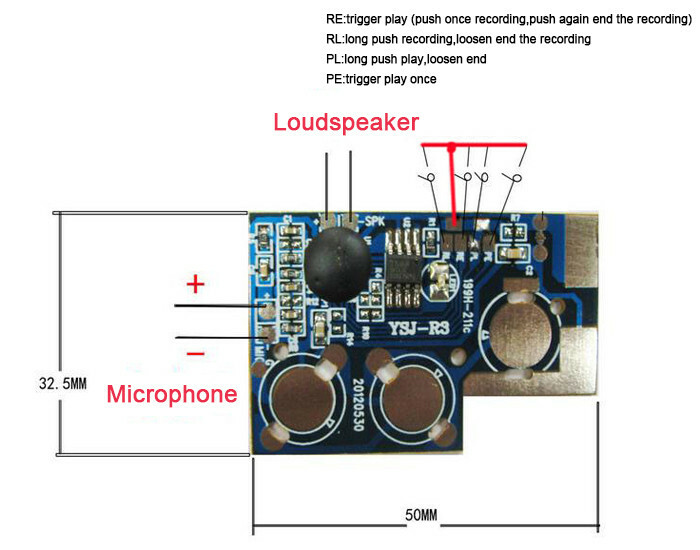 A sound module for greeting cards that play a custom sound when the card is opened. Ideal for custom audio promotional products such as musical greeting cards, musical invitations, talking brochures, and media kits.